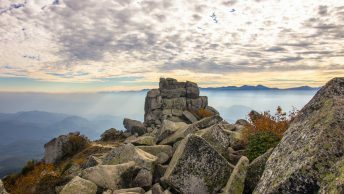 If there was ever a mountain sorely overlooked in Kyuya Fukada’s famous Japanese mountain list its Mount Kentoku as it includes some of the best mountain climbing near Tokyo. This hike is usually undertaken as a day trip from Tokyo though spending an evening at the lovely Kougen Hut plateau is also a worthwhile option. This hike like several others documented on this site starts out from Enzan Station on the Chuo Main Line around 90 minutes by express train from Shinjuku Station or 2.5 hours by local. On weekends and public holidays from April through November there is an infrequent bus service which makes a stop at the Kentokuyama Tozanguchi on its way to the Nishizawa Gorge. During weekdays and at other times you will need your own vehicle or take a 20 minute taxi ride. The previous evening a sizeable thunderstorm passed through the Kanto region which did a good job at blowing away the haze and delivered two days of clear skies in its wake. The friendly taxi driver at Enzan Station quickly whisked me to the trail entrance in seemingly record time while proudly pointing out some of the loftier nearby peaks. The taxi drops you off at the carpark just above the bus stop. While two trails lead up to the Kougen Hut 高原ヒュッテ it’s recommended to track in a clockwise direction flanking the Tokuwagawa River up the main trail and returning via the Douman Ridge 道満尾根 which is steeper. Walking along the road for around 20 minutes brings you to the trail entrance proper and so begins a two hour hike to the Kougen Hut. Whilst not particular steep, it certainly gets the blood pumping if you intend on carrying all your gear. Along the route there are two reliable water holes to fill up, with the later one a five minute walk from the unofficial Kougen Hut campsite. Upon arrival, the plateau was pretty much deserted with presumably most hikers already making their way around the course. The campsite is set gracefully amongst groves of Japanese white birch and there is no shortage of wildlife including plenty of curious Japanese sika deer and even managed to spot a Japanese marten. While camping spots are not marked out, the large open area provides plenty of options for setting up a tent. Otherwise if you decide not to bring your tent, the unsupervised Kougen Hut underwent a substantial renovation last autumn with sleeping space for 10-15 persons and includes an adjacent public restroom. Like the first day the morning was greeted with blue skies and only the slightest breeze. 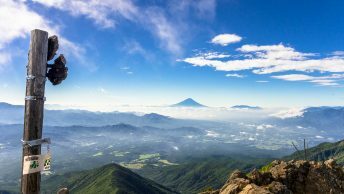 The hike begins with a short walk up to Oogihira another open plateau a few hundred meters above the campsite and provides the first of several excellent views of Mount Fuji and the Minami Alps. From Oogihira the trail enters into a wooded area where the real scramble for the summit begins. Here you will need to negotiate a series of ladders and chains with one section of chain half way up forcing you outside your comfort zone as you clamber precariously over an exposed rock ledge. Just before the summit is a sheer rock precipice which can be tackled via a long chain or alternatively this wall can sidestepped by taking an easier route to the summit on your right. On clear days the craggy summit of Mt. Kentoku (2,031 m) delivers superb 360-degree views including the jutted Mount Kinpu bluff. Options from the summit include heading back the same route or sweeping around the rear side of the mountain using a lesser ventured though steeper trail. I decided to play it safe and returned the same way to collect my belongings at the campsite. The route via the Douman Ridge trail over Mt. Douman 道満山 (1,314 m) back to the bus stop takes around 90 minutes. Did this hike last weekend as my 2nd one on your list. Unfortunately I got to the start of the hike late, so when I got to the top of the ridge where you either head on up the left to Mt Kentoku, or head right along to the Douman ridge, I went right and hence missed out on the summit. It was a good move in the end, as I walked the last hour of the hike in the dark, which was pretty sketchy. Luckily I had a fully charged head torch just for such occasions. It was also a pretty overcast day, so I missed out on the amazing views, but still took some OK mountain range and sunset photos. There was also light snow falling most of the walk, and hence a light covering of snow from just below the hut onwards. Very impressed by the quality of the hut, including a pretty cool fireplace. Only downer is that the toilet are is locked up in the winter. Was thinking it would be good to do a 2 day hike where you get to the hut for sundown, sleep there over night, then head up to Mt Kentoku first thing the next day, and continue on over the ridge for the rest of the day. Not sure where you could get to over that way. Look forward to doing the summit another time. Thanks for your trip report. Too bad you didn’t make it to the summit on this occasion though it seems like you got some great views. You’re right it’s a lovely hut and it had just been rebuilt when I did the hike. Most folk tackle Mt. Kentoku as a day hike but given it’s kind of far from Tokyo sleeping at the Kougen Hut and summiting early the next morning makes a lot of sense. As for continuing along the ridge one option is to head up to Kuroganeyama 黒金山 and finish at the Nishizawa Gorge which takes around 5 hours. Thanks David. An overnight at the Hut, then up to Mt Kentoku, and on to Kuroganeyama and Nishizawa Gorge, sounds like a good idea for a second go at this one – thanks. Really appreciate the amazing site you have here. For non-Japanese speakers like myself, this is a really good guide before we venture into a place where we cannot speak the language. I wonder if you could give me some pointers. I intend to visit Mt Kentoku. My plan is to arrive and stay at the hut before hiking up again at 5am to Mt Kentoku (I can start earlier if I have to). Considering I will have time after reaching the peak I would love to carry on to Kuroganeyama 黑金山. If I follow your recommendation to finish at Nishizawa Gorge, I worry I will miss the last bus (thanks to the bus timing link in your post) from 西沢渓谷入口 15.40pm (Sunday) back to Enzan Station. My concern I do not have tip top physical strengths, am just an average Joe. So long I can be back to Shinjuku by midnight, I’m fine with other travelling methods. Hope you can recommend something. Once again, really appreciate this website. I think your plan is doable though expect a solid second day of hiking. I would suggest making as early start as possible due to the hot weather this weekend. Provided you get moving by say 5:00 am should give you enough time. According to my map from the Kougen Hut via Kuroganeyama to the Nishizawa Gorge bus stop is around 8 hours (without rest breaks). 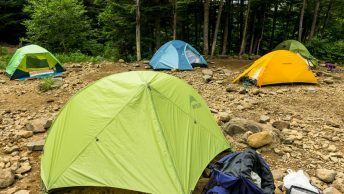 The only thing I’d suggest is if you are carrying a tent, camp instead around 45 mins further up the trail as there is a relatively flat plain before you hit Mt. Kentoku. Note however there are no reliable waterholes after the hut. Thanks for your report! Since this is only going to be my second time hiking in Japan and I’ve never stayed in one of the huts, could you tell me how the hut is equipped? What would I need to bring if I wanted to stay overnight (sleeping bag, etc?)? Also, how early would I need to get to the Enzan Bus Station in order to do this as a day trip? Thanks for your comment and question. The Kougen Hut is a basic refuge hut rebuilt a few years back. The hut offers a dry place to sleep on a raised floor and an outside toilet but little else. You will need to bring a sleeping bag, sleeping pad, stove etc in other words everything other than your tent. There is a waterhole 5 mins walk from the hut and is safe to drink. If you’re planning to do this as a day trip, aim for the first morning bus leaving Enzan Station 08:30 arriving Kentokuyama Tozanguchi at 09:02. The bus runs every day from Oct 1st thru Nov 23rd (2018 schedule). The last bus for Enzan Station leaves at 16:08.